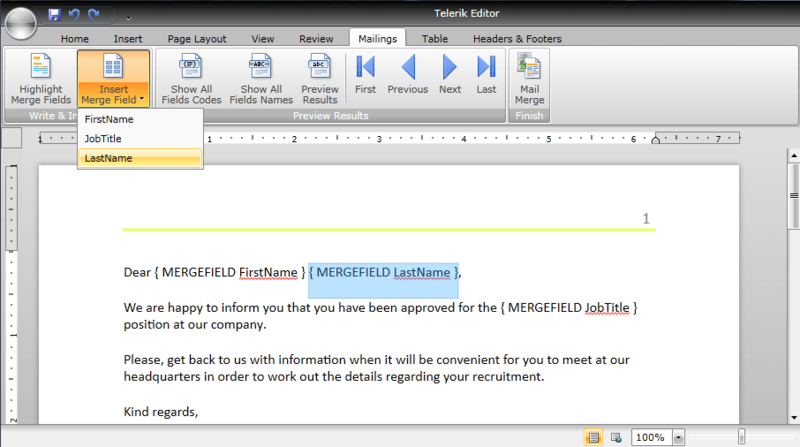 The general use of mail merge is the creation of a document serving as a template and filling in different data, e.g. the name of a person, their address, job title, etc. However, mail merge can be used in other scenarios as well, when some part of the document will be repeated several times with slight alterations. The template which stays mostly unchanged in all records is regarded as “Main Document”. In addition to the static content, it also contains placeholders – “Merge Fields” – which represent the variable data and are replaced with the actual content upon performing the mail merge. The information used for filling up the Merge Fields is kept separately and is called “Data Source”. The options in the drop down button InsertMergeField are automatically populated to match the properties of the objects which are used as data source. You can also switch the display mode of the merge fields from FieldCodes (as in the picture) to FieldNames (e.g. “<<FirstName>>”) or preview the results. If you click the “Preview Results” button, the fields will be replaced with the data from the current record, which by default is the first item from the data source. Then, you can further iterate through the records using the First, Last, Previous and Next buttons. this.radRichTextBox.MailMerge(false); // returns a RadDocument that is the result of Mail Merging all records. The parameter specifies if a page break should be inserted between the records (default value is true). You can further choose what you wish to do with the resulting RadDocument – assign it to a RadRichTextBox’s Document property, export it, etc.